Higurashi When They Cry Ch.1 Onikakushi $5.99 $3.89 35% OFF! Higurashi When They Cry Ch.2 Watanagashi $7.99 $5.59 30% OFF! Higurashi When They Cry Ch.3 Tatarigoroshi $7.99 $5.99 25% OFF! Higurashi When They Cry Ch.4 Himatsubushi $5.99 $4.79 20% OFF! Higurashi When They Cry Ch.5 Meakashi $7.99 $6.79 15% OFF! Umineko When They Cry (Question Arc) $24.99 $18.74 25% OFF! MYTH $14.99 $11.24 25% OFF! Da Capo 3 $39.99 $31.99 20% OFF! Himawari $34.99 $26.24 25% OFF! Gahkthun of the Golden Lightning Steam Edition $39.99 $21.99 45% OFF! Kindred Spirits on the Roof $34.99 $24.49 30% OFF! Kindred Spirits on the Roof Drama CD Vol.1 $9.99 $7.49 25% OFF! Kindred Spirits on the Roof Drama CD Vol.2 $9.99 $7.49 25% OFF! Kindred Spirits on the Roof Drama CD Vol.3 $9.99 $7.49 25% OFF! Kindred Spirits on the Roof Drama CD Vol.4 $15.99 $11.99 25% OFF! eden* $19.99 $8 60% OFF! Supipara Ch.1 $14.99 $9.74 35% OFF! Princess Evangile $34.95 $24.47 30% OFF! The House in Fata Morgana $24.99 $17.49 30% OFF! The House in Fata Morgana Original Soundtrack $11.99 $8.39 30% OFF! The House in Fata Morgana Deluxe Edition $34.99 $24.49 30% OFF! Cho Dengeki Stryker All Ages Version $34.99 $14 60% OFF! Go Go Nippon! 2016 $7.99 $6.79 15% OFF! Go Go Nippon! 2015 $7.99 $4.79 40% OFF! Go Go Nippon! “My First Trip to Japan” $9.99 $4 60% OFF! OZMAFIA!! $34.99 $24.49 30% OFF! Tokyo Babel $34.99 $15.75 55% OFF! The Shadows of Pygmalion $34.99 $27.99 20% OFF! A Kiss for the Petals – Remembering How We Met $7.99 $4.79 40% OFF! 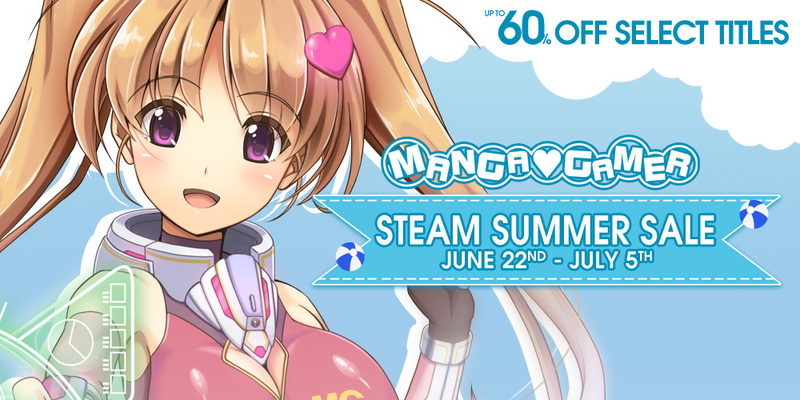 Tagged Steam, Summer, Summer Sale. « Dal Segno Character Intros V.3 – Meet Io!